Sure hope the $$$ goes into grassroots ORGANIZING to keep whoever alternative candidates are accountable!!! 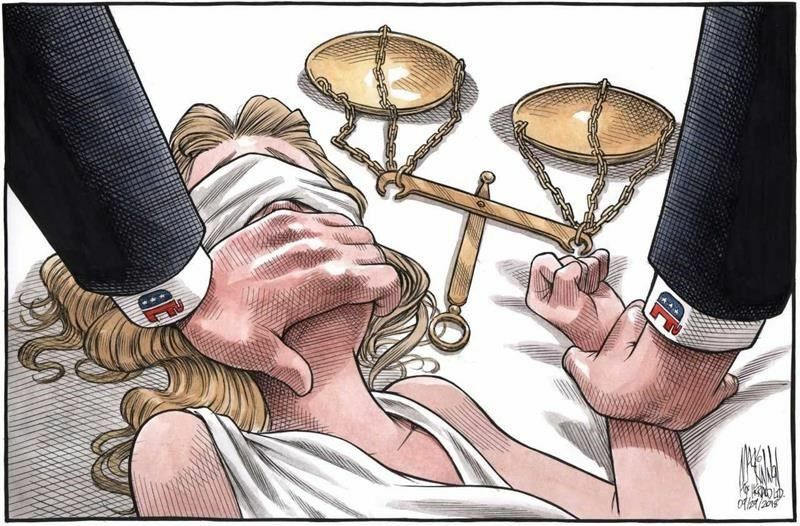 They took an oath to protect the people, Dark money gave a incentive to vote the other way, kavanope !!! 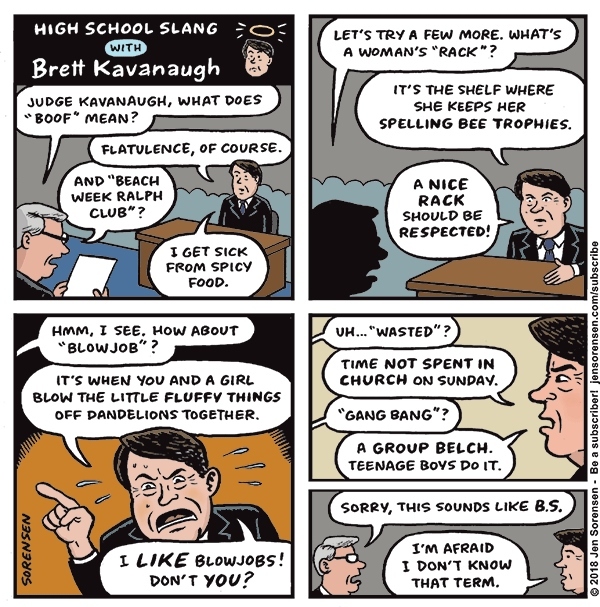 [Jen Sorensen's comics and illustrations have appeared in the The Nation, NPR.org, Ms. Magazine, The Progressive, Politico, Daily Kos, Fusion, The Nib, AlterNet, Truthout, MAD, Nickelodeon, The Los Angeles Times, The Austin Chronicle, The Village Voice, In These Times, The Book of Jezebel, and dozens of other publications around the country. She has created commissioned long-form comics for the ACLU, NPR, Kaiser Health News, The Oregonian, and other clients. If you check out SCOTUSblog, you will see that on next month's docket is: Gamble v. U.S., No. 17-646. Issue(s): Whether the Supreme Court should overrule the "separate sovereigns" exception to the double jeopardy clause. The GOP are desperate. The plan was to appoint Kavanaugh early this week so that he would be seated in time for this ruling. It was in the bag. Saves everyone involved from state charges. Not only Trump but all politicos who were knowingly enriched by the $$$ funneled through the NRA into the coffers of McConnell, Graham, Rubio, Ryan, etc. So if Kavanaugh gets appointed he'd effectively vote to stop states from charging Trump or anyone else involved. Obstruction of justice. SHARE THIS EVERYWHERE. This photo of Trump reminds me of how often Hitler was photographed. This will get worse before it gets better. Same thing with indigenous people. I believe this contributed to an error in who the pollsters and pundits predicted would win the Dem primary in New Mexico last June. The winner was a Native American woman who represented a significant number of indigenous voters who had not been included in the sampling methodology. When the results are in, candidate Deb Haaland won handily. "The Times expose shows in vivid detail how egregious the tax cheating was - not chiseling here and there, but gigantic lies to escape lawful burdens." The Weimar Republic, born both defective and discredited, never really had a chance. Perhaps a better analogy would be with the Roman Republic: After centuries of smashing success, it gradually succumbed to creeping paralysis. It mystifies me how everyone covering the Van Dyke verdict, including the articles posted on Portside, are able to avoid mentioning that the movement that brought Van Dyke to justice in the first place is now unanimously demanding the passage of the ordinance creating an all-elected Civilian Police Accountability Council. The few that mention CPAC speak of it as if it were an organization, not a law. None of them mention the Chicago Alliance Against Racist and Political Repression, which has been pushing community control of the police for 45 years and has been at the crux of this movement. There is only one movement in this City that placed on its banner "Justice for Laquan McDonald, Convict Jason Van Dyke and CPAC Now" and that movement was authored by the Chicago Alliance Against Racist and Political Repression and Black Lives Matter and every other organized movement in this City knows this. Yet the media, by and large, is not asking us why we think the Van Dyke guilty verdict is a victory for CPAC. Why? Because the powers that be and those influenced by them, like GAPA and the Community Renewal Society don't want us to connect the problem to the solution. They want you to focus on the problem of police brutality but never look for the solution in community control of the police, i.e. empowering the people to hold the police accountable for the crimes they commit. On the day the Van Dyke verdict was announced we were so correct to rally at City Hall and disrupt business as usual in the Loop with the battle cries Justice for Laquan, CPAC Now! In the wake of this partial but significant victory we audaciously confronted the ruling class of this City with our demand for radical, systemic change when it comes to police accountability. Even if Jason Van Dyke is sentenced to 6 years for each of the sixteen shots (which totals 96 years) we are still left powerless over who polices our communities and how our communities are policed. We cannot accept this any longer so we must change it Now! CPAC Now!!! CALL YOUR ALDERMAN TODAY! Urge that he or she endorse and sponsor the ordinance for community control of police-CPAC! Your recent article - A ToolKit for Evaluating Your Cities Police Policies - is an excellent resource to those organizing against violent police practices in local communities. My organization, Researching the American-Israeli Alliance (RAIA), has a project called Palestine is Here (PalestineIsHere.org) that tracks US police exchanges with Israel's apartheid military, police and intelligence services. We think our database should be included in your evaluation tool as well as our Deadly Exchange report written for the Jewish Voice for Peace (JVP) Deadly Exchange campaign (the report can be found on PalestineIsHere.org under Reports). We hope that you include these two resources and would be open to discussing the best way to make this available to your readers. Thanks and hope to hear from you soon! I do not think the program is a difficult as some make out. Its called PAY THE LOSERS. AS long as we live and die by commodities --- and the cash it takes to obtain them -- trade will happen. trade with other nations will create winners and losers in each partner country, depending on the relative efficiencies of the products or services each nation desires to export. This is called comparative advantage in economics. The role of economies of scale and giant multinational corps adds another layer of complexity to who wins and who loses, but does not change the basic equation. Some jobs will be created, some will be destroyed by trade. PAY THE LOSERS means compensate those hurt by trade sufficiently to make them winners in the changed division of labor. Denmark does this via training, stipends, universal health and retirement security. Denmark's economy is nearly 50 percent exports/GEP. US is about 13% exports/ GDP. There is no stopping either trade or immigration (globalization's lagging, but always present twin). If you try and stop it, like stopping water from running downhill, black markets --- dams become waterfalls and floods, to persist the metaphor -- will intervene. Plus leaks -- e.g. bribes of public officials to get through the bans. PAY THE LOSERS works both in the country, and is the soul of internationalism upon which all hopes of peace and mutual happiness between nations, peoples an nature depend. One these cooperative housing developments built with union funds is Penn South - so glad we live here. Have circulated this to many of my fellow cooperators, and it received a good response. This is an interesting, incomplete history of some of the cooperative housing efforts in NYC. How and why those efforts succeeded and failed are not really addressed. IMO, unions, in and of themselves, cannot solve the housing crisis in the US or NYC but the article doesn't really make the case that they can. We need a political revolution so as to invest in actually affordable housing. Part of that will require electing progressive politicians, part in lobbying for resources and change. Will we take the next steps on the path in November? Thanks to Portside for the link. It could be done again, but it won't be. This is not your great-grandpa's working class. The story of the USA sugar industry in Puerto Rico. The first US governor realized the potential for profits in sugar, and rapidly the good farm land was bought up by US corporations. When sugar was no longer profitable, the land was abandoned. It's gratifying to see so much activity in nations world - wide. I agree completely that we need a global Left. New rules proposed by the Trump administration and Secretary of Interior Ryan Zinke will impose steep fees and costs on demonstrations in Washington, D.C; effectively ban protests on the White House sidewalks; force protesters to pay the costs of barricades erected at police discretion, park ranger wages and overtime, and harm to grass from standing on it; create waiting periods removing any obligation of the government to promptly process or approve permits; restrict and suppress spontaneous demonstrations that respond to breaking events; create hair-triggers allowing police to end protests for the most minor of issues; restrict sound and staging; ban long term vigils or protest presences; make protesters pay for expensive "turf covers," among many other radical restrictions of free speech rights. These changes will affect all parkland under the National Park Service (NPS) in the nation's capital including the National Mall, Lafayette Park, the White House Sidewalk, Lincoln Memorial, the Ellipse, Freedom Plaza and the sidewalks and parkland along Pennsylvania Avenue - including the sidewalk in front of the Trump Hotel. This is a dangerous anti-democratic proposal. If enacted, this will mark the end of free speech as we know it and will be a dystopian model that spreads across the county. The NPS is required by law to respond to the public's comments on these new changes. Comment now and make them stop this proposed roll back of precious civil rights and democratic freedoms. Don't delay - you must submit your comment by October 15. To create an effective comment: 1. Customize your comment with your own words - let NPS know how these changes will hurt you, the groups/issues that matter to you, and democracy overall 2. Read 12 Ways Trump's New Rules Will Crush Free Speech in D.C. and comment on more than just the Pay to Protest provisions - - NPS is rolling back decades of hard-fought free speech rights in this one massive rulemaking! Deadlines have already passed in Alaska and Rhode Island. Many more are close. 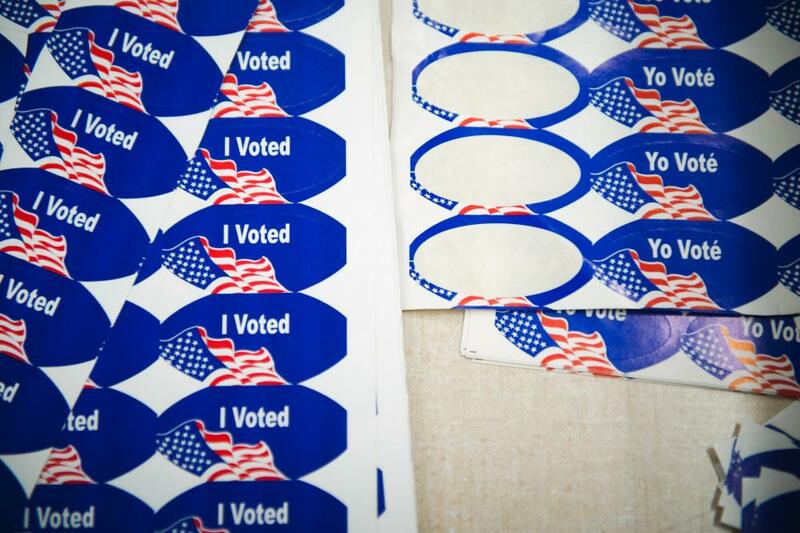 Here's a list of each state's voter registration deadline. The mail deadlines are when the applications should be postmarked, unless stated otherwise. Some states allow you to register through Election Day, but may have special requirements to do so. Tap on a state's name for more detailed information. 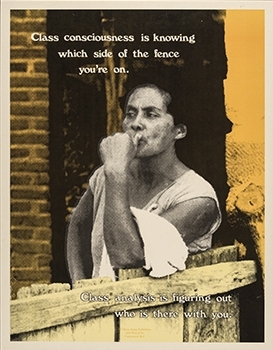 Poster of the Week - Which Side Are you On? Class consciousness is knowing which side of the fence you're on. Class analysis is figuring out who is there with you. And please listen to Eve Ensler's moving and brilliant, Letter to White Women Who Support Brett Kavanaugh. Pass it on to as many people as you know. It should be required reading in every high school. Peace activists long have used the term “military - industrial complex” for purposes both analytical and polemical. The concept was brought to prominence at the height of the Cold War by one of the preeminent architects of the immense constellations of institutions it describes, U.S. general and president Dwight D. Eisenhower. But like those institutions, the concept of the military - industrial complex has drifted down to us as much by inertia as by volition, a tool picked up when convenient, but seldom sharpened, modified, re - tooled. In the post - Cold War period, peace and disarmament advocates have sought to build broader coalitions by stressing the diversion of resources from human needs to military spending and by highlighting the ability of military - industrial complex organizations to deploy their economic power to sustain spending on armaments and a militarized foreign policy. These efforts had little success. We are now in a time clearly distinguishable from the immediate post - Cold War period, one characterized by the relative decline of U.S. power, the rise or resurgence of its nuclear - armed adversaries, and a climate of intense international economic and geopolitical competition in a fragile, crisis - ridden global economy. If the concept of the military - industrial complex is to be useful, it must be re-thought in this moment. This would be a major undertaking, requiring the work of many; I can do no more in this piece than to suggest some relevant questions and considerations. 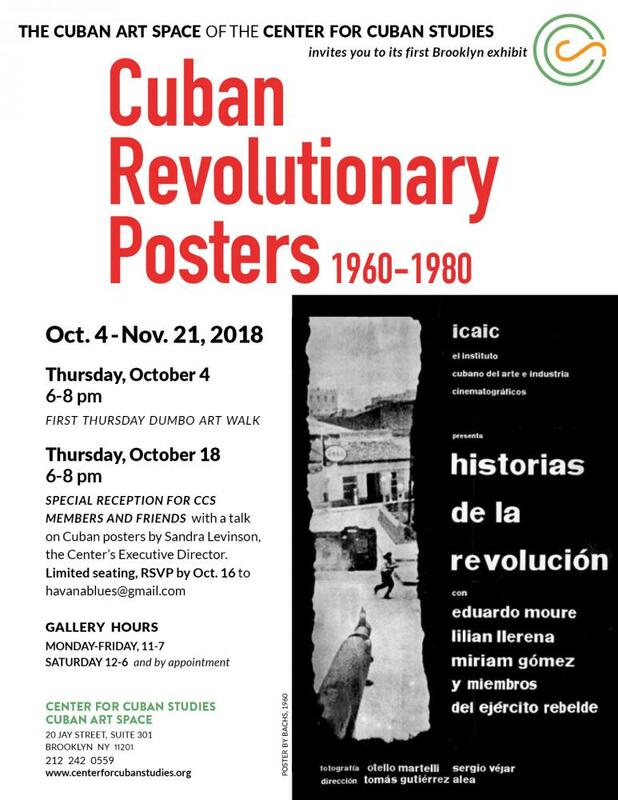 The first art works collected by the Center for Cuban Studies were posters. When the Center opened its doors in 1972, the poster collection of its executive director came with her. We continued collecting posters on our travels to Cuba: many came as gifts from host institutions, others from office walls or carefully removed from street displays. They gave us proof of Cuba’s artistic and political commitment. Most of the posters of the 1960s and 1970s that people know about came from two institutions: ICAIC, the Cuban Film Institute, and OSPAAAL, the Organization of Solidarity with Africa, Asia and Latin America. But those not so known are among the most fascinating. They address domestic issues—work, education, building a socialist society, the heroic history of the Revolution, cultural events, and more. These posters were produced by state organismos: DOR (Department of Revolutionary Orientation); the Ministry of Culture, UNEAC (the Cuban Writers and Artists Union), and others. Past Center exhibits have honored the work of individual graphic designers such as Bachs (Eduardo Muñoz Bachs), who worked with ICAIC and was its most prolific artist, and Alfredo Rostgaard, who designed for OSPAAAL, ICAIC, UNEAC and other cultural and political institutions. We did an exhibit of the work of contemporary graphic designers Pepe Menéndez and Eduardo Marin, and also did one of 177 posters dedicated to Cuban solidarity with other countries. With this exhibit we want to introduce a small part of the CCS poster collection to our new Brooklyn constituency. The exhibit includes film and solidarity posters, and most important those that celebrate the history and daily life of a young country attempting to build a revolutionary socialist society. Many of the posters are hand silk-screened, so rare here, but easier and less expensive to produce than offset, which required printing plants. Most of the silkscreens were produced in limited editions; the largest, 500, was produced by ICAIC. But others, for local carnivals, or special historic and political occasions, were produced by local propaganda offices in small editions, probably no more than 50, to be placed in strategic offices, buildings, or street corners. Solidarity posters were produced mostly in offset because the smaller ones were folded into quarters and included in OSPAAAL’s magazine. Both ICAIC and OSPAAAL have since reproduced their most popular posters: ICAIC began rescreening its film posters in the 1990s. Almost all of the posters shown in this exhibit are the original vintage posters and they are for sale only if we have more than the one copy in our permanent collection. Most of the film posters we’ve put up, however, are rescreened and for sale. The Center is in the process of doing an exact count of the number of individual designs in our collection of approximately 5,000 posters. Future poster exhibits will include works from 1980-2000 and those produced since 2000. Graphic designers and students of design should have a field day! Doors open at 6pm. Please note that security scanning will be required at the entrance to the event. 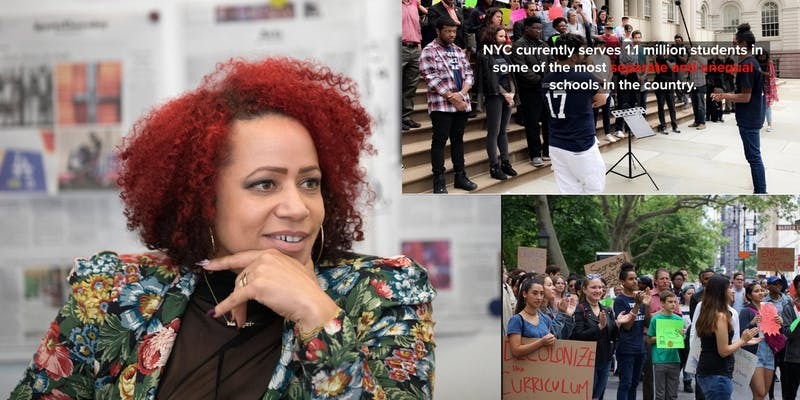 What are the different tools for combating racism today, after Obama’s presidency and the backlash of the Trump regime? What do the tools of struggle and emancipation look like, and do aesthetics play a role? 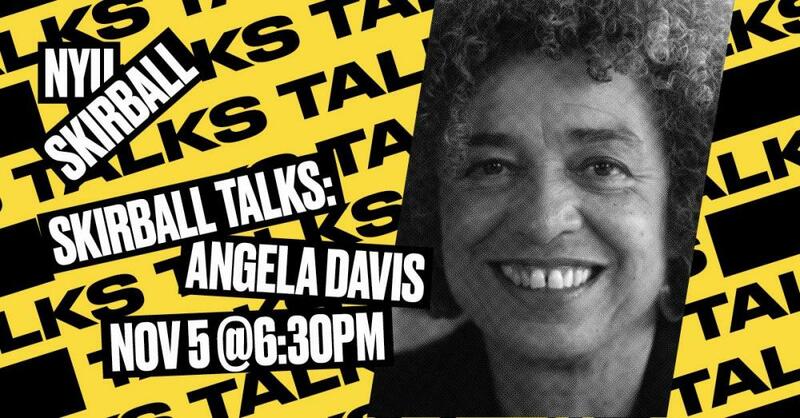 Please join us as activist, scholar and writer Angela Davis discusses politics & aesthetics in the era of Black Lives Matter. Co-sponsored by the Institute of African American Affairs & Center for Black Visual Culture. 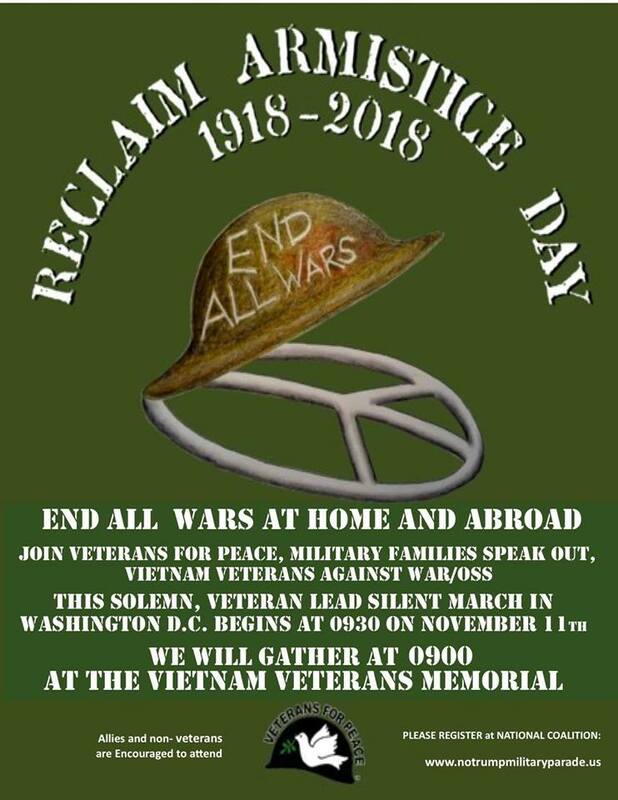 Join VETERANS PEACE MARCH #N11, Veterans For Peace, Military Families Speak Out and many more for a march on the Mall to honor thoes who have given their lives in war and to commit to a world without war.#EndAllWars at home and abroad.